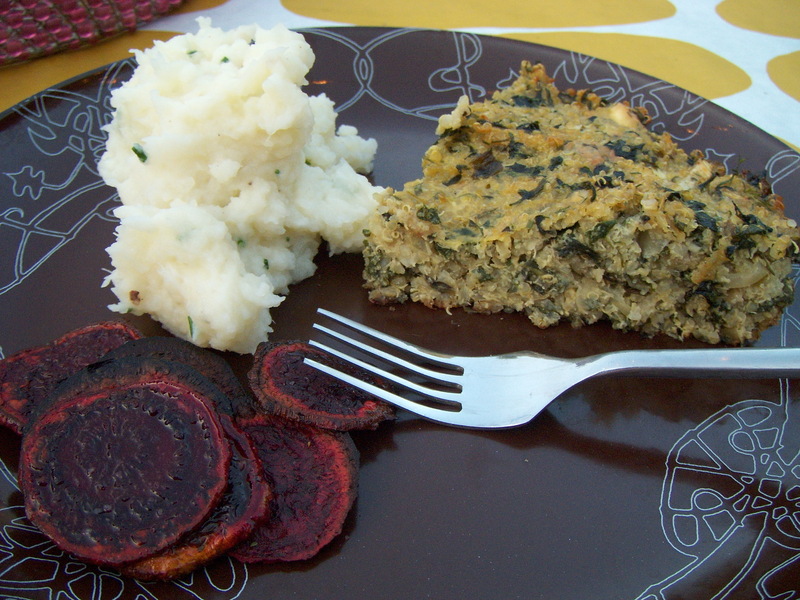 Due to popular demand, below is the recipe for the Quinoa & Greens Pie from Vegetarian Times we made for an backyard meal with friends a few months ago, served here with mashed turnips and Mark Bittman’s beet chips (at least the ones that didn’t burn). Place quinoa in small saucepan, and toast over medium heat 2 to 3 minutes, or until almost dry. Ad 1 cup water, and season with salt, f desired. Cover, and bring to a boil. Reduce heat to medium-low, and simmer, covered, 15 minutes. Remove from heat, and transfer to large bowl. Heat large pot over medium heat. Add chicory, and cook 3 to 5 minutes, or until wilted, stirring frequently or tossing with tongs. Add romaine, and wilt 1 to 2 minutes more. Transfer greens to strainer, and squeeze out excess moisture. Transfer to cutting board, and chop into small pieces. Stir into quinoa. Preheat oven to 350*. heat 1 Tbs. oil in skillet over medium-high heat. Add onions, and sauté 10 minutes, or until browned. Add cooked onions, green onions, dill, feta cheese, and goat cheese to quinoa mixture. Stir in eggs; season with salt and pepper, if desired. Pour 1 Tbs. oil into 9″ pie pan, and place in oven. hat 5 minutes, or until oil is hot. swirl oil to coat bottom of pan, then spread quinoa mixture in pan with spatula. Bake 20 minutes. Drizzle pie with remaining 1 Tbs. oil, and bake 20 to 30 minutes more, or until golden brown.